There is always a debate on this matter. Which is better? WordPress or Blogger? 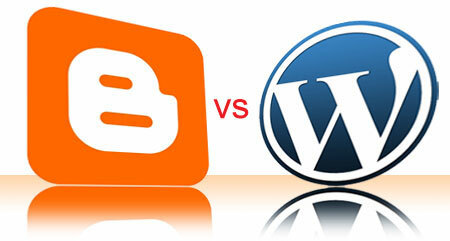 The question is still unknown because WordPress blogs are increasing likewise Blogger blogs. Both are top platforms and are developing and advancing each day… WordPress fixes their bugs in every new version and blogger adds new features occasionally. Sometime ago WordPress was updated to version 3.5 and this made their blogs more secure and easy to use. Again Blogger added features like robots.txt, meta description, commands etc.. to optimize blogs for search engines. Development is going on and growth is also taking place. It’s not that a blogger blogging on the WordPress(WP) platform makes good revenue,many are are also making good money from blogger too..
originality, and I tell you my friend’The Sky Is Your Starting Point’. Still, to get a clear picture of the two platforms I will provide some points outlining the difference between Blogger and WordPress. Blogger requires less investment and less technical knowledge as it doesn’t require any hosting. You don’t need to spent money for hosting, you just need to buy a domain name from sites like GoDaddy and pay a very less amount yearly. Easy to understand and work with, especially for newbie bloggers. Provides a gadgets/plugins store but you can’t get all what you want without going for a search in sites like bloggerplugins. They have good collection of widgets for blogger blogs. Blogger Provides free premium looking templates as well as awesome dynamic views, but for mor templates explore sites like Btemplate or bloggerthemes. Fast to work even on a slow internet speed like GPRS and low bandwidth dial-up. Furthermore Blogger is a secured platform I.e. the blogspot blogs are rarely hacked. Those are my very few Advantages Blogging with the Blogger platform. Watch out for the part 2 of this post where i will also list the advantages of blogging on the WordPress platform.